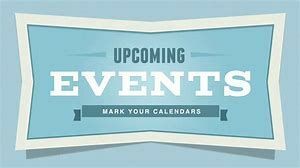 Up-Coming Events for the year 2019. There are a large range of activities listed below covering almost all interests. The list is not inclusive or exhaustive but serves as a guide, it includes social justice events, pilgrimages, choral workshops, liturgical events, weekend retreats, parish events such as, dances, BBQ, local parish fund raisers and more. Please make a note of the dates in your diary or electronic device. You are warmly invited to participate in these events, please do get involved and engaged with our community and parish. Our Social Events: Our parish is the center where our spiritual and sacramental needs are fulfilled through the pastoral care we receive, mainly from the parish clergy supported by every parishioner. Our parish is a vibrant, close-knit parish community. It is also located in one of the most multicultural areas of London; we belong to a universal Church and a truly diverse neighbourhood. Our social events help to bring and bind our diverse parish community together and further strengthen that community bond and unity. We all constantly strive to promote a sense of family and community in our parish. This begins with all our liturgical celebrations and extends to our social activities, of which we host a number every year. Our Parish has an active social events and fundraising committee whose ministry supports, promotes and works together to foster community cohesion, bringing us together through this ministry. The Committee helps to organize parish social activities. These activities provide occasions for socialising and celebrating together. 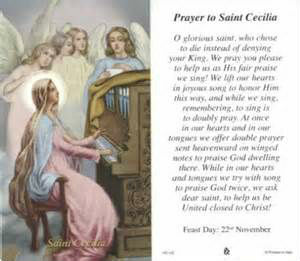 They also provide opportunities for sharing our faith and supporting one another on our journey through life together. We encourage members of the parish to support and join the social events and fundraising committee. At St. Leonard's, Streatham. Led By Julie McCann. 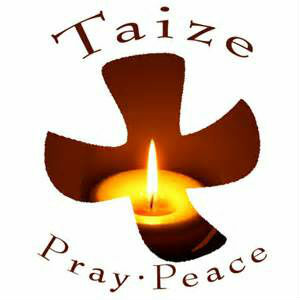 A Taizé Prayer Service is held at 18.30 p.m. every second Sunday of the month, at St. Leonard's Church, Streatham High Road, SW16 1HS. Music rehearsals - 17:15 p.m.
- Brother Roger, founder of the Taizé Community, France. 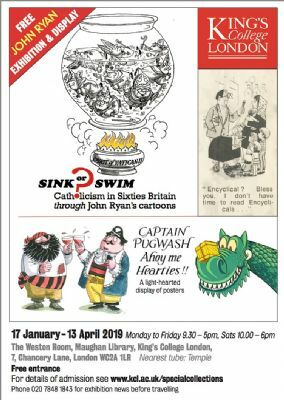 Sunday 10:00 to 6:00 p.m.
Parishioner' Isabel Ryan's father John Ryan was the weekly cartoonist for the Catholic Herald newspaper from 1964 - 2007. Isabel, together with teacher and acclaimed historian of religion Alana Harris, has produced an exhibition where key themes of concern to the Catholic Church in Britain in the 1960s are illustrated, through the gentle and witty lens of her dad's cartoons: the implementing of the tumultuous Second Vatican Council, the Humanae Vitae Encyclical, the permissive society, secularisation and progressive politics. With showcases, slide show and a 'Timeline', this exhibition is free of charge and open until 13 April. "Thanks for a fresh and stimulating take on Vatican II Church in England – humour is a great teacher." "A fantastically engaging insight into Catholicism & Britain's social & cultural history." "Beautifully put-together memories, with very interesting 'dialogues' and information clear and entertaining." The Rite of Election will soon be with us again. Each year this event grows and grows. The invitation has been extended to us again to support this celebration of welcome. Come and be part of the open arms of the Church. The number of seats available for the choir are limited. NB: you MUST attend BOTH rehearsals for the Rite of Election. Eucharistic Adoration in Lent 2019 in the Lambeth Catholic Deanery. St. Simon and St. Jude, Streatham Hill - Mondays 9.45 - 11.00 a.m.
Once again, the Chrism Mass will be celebrated on the Wednesday of Holy Week. For a booking form click here please. 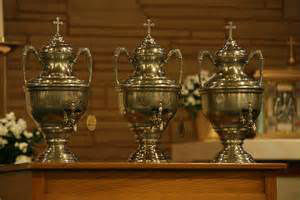 We support the sacramental life of the Church and enter into the mystery every time we celebrate the Mass of Chrism. Booking form click here. Come and be “the Church at prayer” – doing what we do best.